Make no mistake about it, Building Bridges- The Cinema of Jean Rouch (only the fourth English language book about the man himself) is a complex work. This complexity is a result of several coinciding factors- the wide variety of contributors (who each pen an essay about a certain aspect of Rouch’s oeuvre or methodology) and the relative lack of availability his films have outside his native France being two of them. Perhaps the leading factor to make the book so challenging though lies paradoxically in the career of Rouch himself, on the surface relatively simple (documentary filmmaker), but in practice anchored to a vast array of sociological, cultural, ethnographic and cinematic diversifications that, instead of drawing attention to his impact on film as an art form, have detracted from it. Divided into three main sections (from which spread out like branches a total of 23 relevant chapters on the minutiae of each aspect of his career), Building Bridges- The Cinema of Jean Rouch covers biographical details, the films and finally what are called ‘foundations and legacies’- an attempt to reconcile Rouch’s philosophical position with that of both his contemporaries and his cinematic ancestors. The overall impact is like a three-dimensional portrait, shaping not only Rouch’s working life but also the man himself. In the warm evocations of Rouch as a human being that constitute the biographical section of the book several things become swiftly apparent. Firstly, Rouch’s life spanned the key years when the cinema moved beyond its ‘primitive’ stage into one of genre, stars and commercialisation but he remained true to his principles throughout. These principles were built on an interest in capturing life unfiltered by editing and letting reality unfold before his often handheld camera, making him the Father of cinema verite. This personal approach to his subject-matter and his creative use of the technical materials of film in capturing them also strongly links Rouch with the directors of the French New Wave, their resulting legacy becoming his by implication, his influence therefore stretching across continents, cultures and throughout history. The largest section of the book is understandably concerned with essays about the films Rouch made- these films largely being, as Paul Henley notes, ‘ethnographic in character’ (p.39). The value of these films transcends any cinematic merit- they are social documents, invaluable records of traditions, behaviour and modus operandi of places far away, of times long gone. In chapter 4, Rouch’s former collaborator Brice Ahounou observes this very fact as he poses the question ‘would we have believed this ritual existed had images of it not been brought back?’ (p.67) Thus, in sociological terms, Rouch was a ‘documentarian’ par excellence, his films are not merely part of history- they are history. If there is a problem with the in-depth discussions of Rouch’s work in this English language publication it is that many of the films themselves continue to be unavailable in translation. This is not the book’s fault however (and indeed it may hopefully serve as an open invitation for those films to be given the wider audience they deserve), but this is not an insurmountable obstacle given the contextual information provided by each contributor. Pleasingly, the chapters highlight the diversity of Rouch’s work- one might focus on a single film (such as Joram ten Brink’s chapter 11 focus on Rouch’s perhaps best-known work Chronique d’un ete, whilst another draws on other elements of the artist’s life to then inform a discussion as with the superb ethnographic photographs taken in Ghana (then called the Gold Coast) in the mid. 1950s on page 110. The final section of Building Bridges- The Cinema of Jean Rouch’s tripartite structure is concerned with Rouch’s roots in surrealism, the influences upon him and with his legacy in establishing an approach to documentary still widely used today. In moving through key points in Rouch’s artistic life, it is again interesting to note the links to the personal authorship favoured by those Cahiers du Cinema critics (who would become the mainstays of the New Wave film movement) in the form of Astruc’s famous camera-stylo. This is supplemented by Ian Christie’s essay which evokes ‘Rouch’ (the auteur) as opposed to Rouch (who was tragically killed in 2004), the logical conclusion to draw being that, like those he influenced, Rouch was a film auteur- his work having an unassailable quality that is indisputably ‘Rouchian’ in nature. Given the lack of available English language material about Jean Rouch it is inevitable that any new publication will both garner the publicity of curious interest yet potentially also become the benchmark for future writings. Joram ten Brink has edited a book that emits a clarion call for a wider appreciation of Rouch and his work, a call which one hopes will travel passim like the influence of the man himself. Building Bridges- The Cinema of Jean Rouch efficiently yet subtly captures the very essence of a true innovator- an improvisator who propped the camera on his forehead after his tripod broke, a witty documentary-film maker who never lost his good humour and a man who was above all a great ambassador not only for cinema but for life itself. 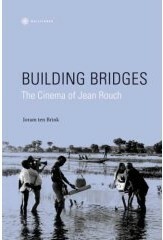 ‘Building Bridges- The Cinema of Jean Rouch’ is published by the Wallflower Press.